I’ve said it before, and I’ll say it again — buying a house isn’t easy, there’s a lot to know and you simply cannot go into it without some education. One of the more important forms in your buying process comes when you make loan application. At that time, you’ll get something called a Truth in Lending disclosure, which can be both incredibly informing and absolutely terrifying. Even though the Truth in Lending forms will be easier to understand come October, the new forms may still be confusing for non-real estate types, so I thought I’d write an article about them to help you get through it. Look for these now, though closing companies and banks have until October 3, 2015 to roll them out to customers like yourself. The Truth in Lending Act (TILA) was brought into being in 1968, as part of the Consumer Credit Protection Act. Both became effective in 1969. Before that time, lenders weren’t required to make disclosures about the loans you were signing, which led to serious problems over time. Still, it wasn’t enough to protect consumers, so TILA and Regulation Z (another part of the law that has to do with loan disclosures) continued to be amended. In 1994, The Home Ownership and Equity Protection Act (HOEPA) created the Truth in Lending disclosure, in a way. The form was meant to allow consumers to be able to compare different loan products at a glance, without a lot of terrifying small print or technical language. It was a start, but the forms from those days were still very confusing for several reasons. Banks also were allowed to make huge errors on these forms, which led to many disgruntled homebuyers at the closing table. Further legislation closed those loopholes and others changed the format of those disclosures some of us grew to know and love. The new disclosures are a far cry from the old ones, but there are still things on the forms that demand a careful eye. In case you’re wondering what the fuss is all about, the changes to the FILA disclosure are really sweeping. You can take a gander at the old form here and compare it to the new form. As you can see, the new disclosure is not only designed in a way that’s easier to see, it’s also easier for the consumer to understand — which was the whole point of the change. The problem with letting bankers, realtors and their ilk (like us) design these forms is that we know what all this stuff means. We know what a prepayment penalty is and how APR and your loan’s interest rate differ. Unfortunately, we tend to forget that you don’t live and breathe the real estate industry, you’re just visiting so you can get a place of your own and be on your way. The new form is going to be really great for clearing up a lot of confusion and eliminating the scary stuff that we used to have to deal with all the time as agents. It also updates the forms so that lines referring to extinct exotic mortgages are eliminated and replaced with more useful information. It’s a really good move overall and in some ways I wish we had these new forms at our own closing at the beginning of this summer. Now you know why they changed these forms and a little background on them, so I guess that means it’s time to get down to business and explain it, line by tedious line. You may think this is boring stuff right now, but trust me, when you have a Truth in Lending disclosure in front of you, these details should answer any questions you might have. 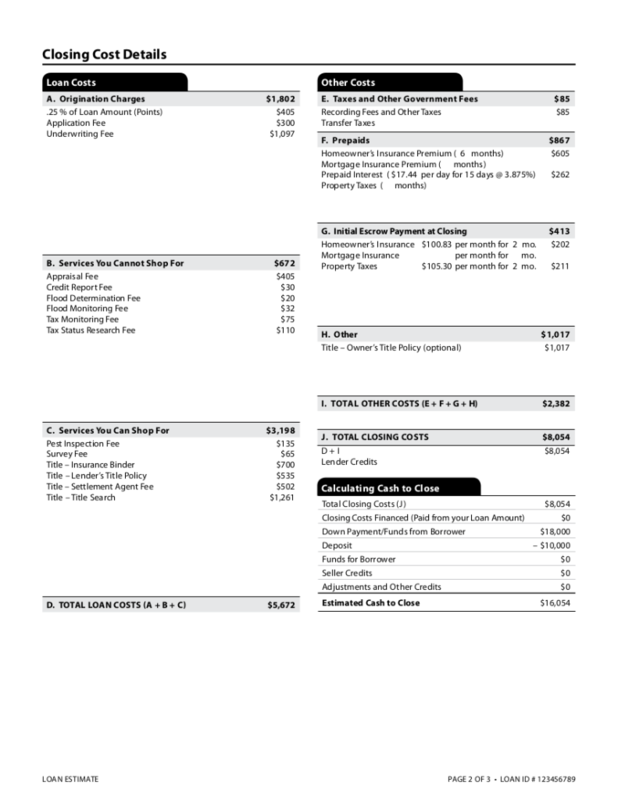 Page one is the loan estimate page, it’ll give you all the basic financial facts for the loan you’re applying for through your bank. If you apply for more than one loan, this page will provide you an at a glance point of comparison (though do read all the details before committing). The header is divided into two columns. On the left are all your particulars, as well as the sale price you’ve asked for or that corresponds to your maximum loan approval. On the right are more details about your loan, including the length of the term, the purpose of your loan (most of the time you will see “purchase” in that space), product type, loan type, the loan ID number and the details on your rate lock. You want this box to always be checked “yes” and to heed the length of your lock—after that date you’ll be subject to whatever the new rate is, regardless of how long ago you applied for this loan. Rate lock hasn’t been a big deal for a while since rates have been relatively flat and relatively low, but with the Fed itching to raise rates, it’s important to not let your rate expire while you’re looking for a home. The real estate marketing is reawakening, the end to crazy low interest rates is coming. Loan Amount. This is how much money you’re borrowing from the bank. It will most likely differ from the “purchase price” since you’ll need to bring a down payment of some sort. Both numbers are based on information you’ve given your lender. Most loans won’t see the principal increase, but the rare exotic mortgage can create a situation where this can happen. Interest Rate. The interest rate is based on your risk as a borrower, the rate of the day, how much you’re borrowing and the rate for the loan program you’re using. After all that’s considered, your lender puts the number in this box. In the case of an adjustable rate mortgage (ARM), this number can increase during the loan tenure, by a great deal. Monthly Principal & Interest. In Subsection 2, your PITI will be figured in its entirely, but for simplicity’s sake, your basic principal and interest payment appears on this line. This is not what you’ll pay to the bank if you’ve got an escrow account, it’s just the principal and the interest on your loan. It can increase during your loan tenure, only if you’ve got an ARM or exotic mortgage. Prepayment Penalty. Some loans will charge you extra for the privilege of paying them off sooner. If yours is one of these, that information will appear on this line, including what the maximum financial penalty can be under what specific conditions. Balloon Payment. Most loans these days won’t have a balloon, but a few still do. If you’ve got one of these loans, the information on the balloon will appear here. This way you know how much you have to repay when the loan ends, as well as when the term is up. Many times borrowers refinance before the balloon is due. Payment Calculation. This section is a little tricky, I had to look it up in the instructions to figure out exactly what it was talking about. Most loans, even fixed rate loans, see the payment change throughout the term of the loan. This section covers those scenarios. So, for example, if you’ve got mortgage insurance in place for the first seven years, the parts that go into that payment will be in the first section of the box. The next section over will explain the payment after that mortgage insurance payment is over, and so forth. It also includes an estimated escrow figure, which should get larger as time passes to account for increases in taxes and insurance — if it stays the same over time on your form, just ignore that part of the figure. There’s no way your escrow payment won’t get bigger over time. Estimated Total Monthly Payment. Below the payment calculation section will be the estimated total payment. That’s the total of your principal, interest, mortgage insurance and escrow calculation for each time frame in the payment calculation section. Again, if the escrow figure doesn’t increase over time in the figure above, this will be off as you move across the page. Estimated Closing Costs. The figure you see here is the total of Subsections A through J on the next page. These are only estimated costs, some optional services might not be included and items like taxes and insurance are subject to change until the closing company has verified them. Estimated Cash to Close. Cash to close is also figured on page two of the form, near the bottom, under “Calculating Cash to Close.” We’ll get into that later. 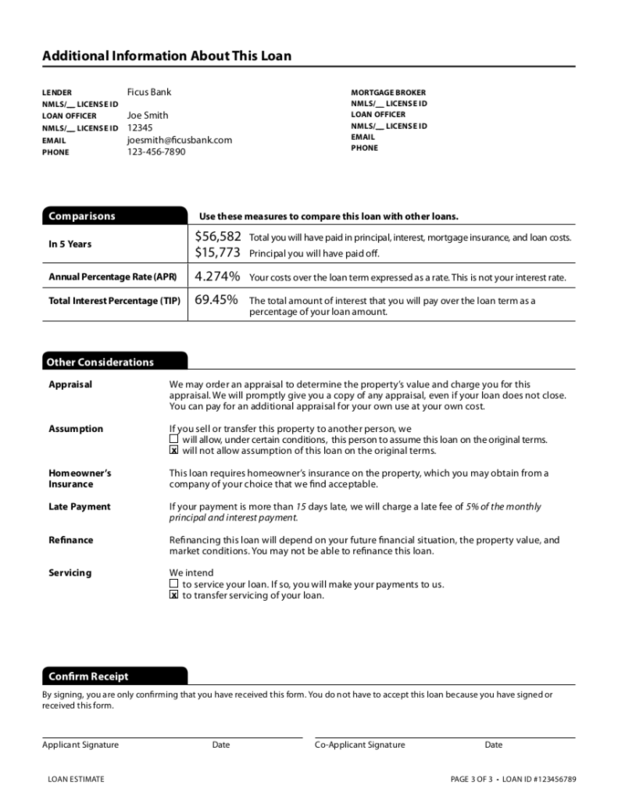 This section is the calculation page for those last two figures on the front page of your Truth in Lending document. It’s important to know where your closing cost figures come from, even if you’re having the seller pay them. These expenses relate directly to your loan. If you had purchased your home with cash, these items might be optional or not apply at all. Item A: Origination Charges. Your bank “originates” a loan when they agree to loan you the money to buy your house at closing. They don’t do this for fun, they do it for profit. This section outlines how they get paid. Item B: Services You Cannot Shop For. There are going to be a lot of services you’ll need to close your loan, these are the items that the bank doesn’t handle directly and are non-negotiable. Item C: Services You Can Shop For. This section gives you a list of services related to your loan that you can, theoretically, shop for. Certainly, you can choose your inspector and the person who does a survey, but the sample also suggests shopping for title insurance. You can do that, for sure, but rates won’t be a lot different between companies located within a small area. Item D: Total Loan Costs. Another line used for totaling. Hooray for extra lines! You’ll find all the items under “Loan Costs” totaled here. Item E: Taxes and Other Government Fees. Any government fees involved in the transaction, such as recording fees, are in this section. This section does not include your property taxes. Item F: Prepaids. Most mortgages require that you prepay interest for the number of days you’ll own your home before you actually make the first payment. Others require prepayment of items like homeowners insurance. All of that will appear in this section. Item G: Initial Escrow Payment at Closing. Subsection G establishes your escrow account, if you have one. Usually banks like you to put something in that account before you close, so they can feel reasonably assured that even if you end up in foreclosure they’ll have something to pay the remainder of your taxes and insurance with. Item H: Other. Literally, this is the other stuff you might need for your home closing. It includes items like home warranties paid for by the buyer, credit life insurance and owner’s title insurance coverage. Item I: Total Other Costs. This is where they total your “other” costs. Item J: Total Closing Costs. Even more math, this is the total of your fees under “Loan Costs” and “Other Costs.” It also includes a line for lender credits, if any, that might reduce your closing costs. Calculating Cash to Close. This whole section is for transparency, so you can see where all the numbers that go into your “Cash to Close” figure come from. They determine this figure by adding up all your closing costs from Subsection J and your down payment, then subtracting out any closing costs you plan to finance, any deposit you’ll put in escrow and any other credits you’re anticipating at closing. This section has extra information about your loan that wasn’t included in the first two sections. The header for this page is also a great place to check for contact information of your favorite loan officer. In 5 Years. 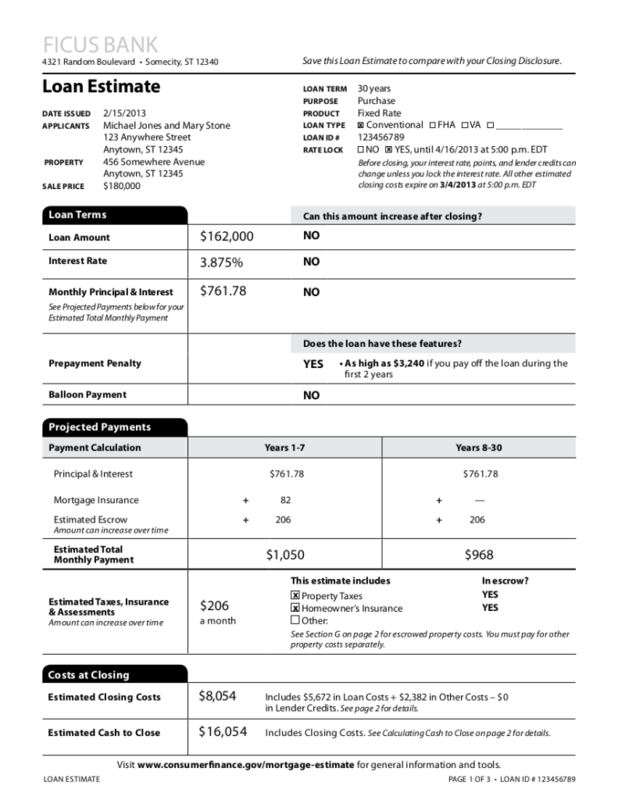 On the old forms, there’s a section that shows how much you will have paid for your home through the life of the loan. That’s a terrifying section for buyers and has scared more than one first timer away from the entire process. Instead of that terrifying figure (and recognizing that most buyers won’t pay off their mortgage before they sell), this figure is now calculated over five years. It includes both total loan-related costs, including mortgage insurance and interest and a separate figure for just the principal you will have paid in that same time period. Remember that you pay more fees and interest in the front half of your loan, so the longer you’re in your home, the better these two figures will balance. Annual Percentage Rate (APR). The APR is NOT your interest rate. It is, instead, a rate calculated based on your interest rate and other fees required to make your loan. Don’t get too wrapped up in this figure, it’s a required disclosure that doesn’t mean much to the average home owner. Total Interest Percentage (TIP). The TIP, on the other hand, can be a handy measure of just how much you’ll spend to borrow the money to buy your home. Don’t be shocked if it’s in the double digits, that’s normal. This number represents the total amount of interest you’ll pay over the life of the loan, expressed as a percentage of loan amount. If you borrowed $100k, for example, and your interest over the life of the loan totaled $50k, your TIP would be 50%. Appraisal. You’re going to need one, regardless of what this line says. Don’t risk buying a home that’s not worth what you’ve paid. Assumption. Some loans are assumable, some are not. This line makes it clear which yours is. Homeowner’s Insurance. You’re going to need this, too, also regardless of what this line says. Late Payment. This line explains the penalty for being late. Usually there’s a percentage fee added to your normal fee, so long as you’re not a step away from foreclosure. Refinance. This section explains your refinance options with the loan you’ve taken out. Some products are eligible for a streamline refi, these are awesome loan features. Servicing. Many banks plan to immediately sell their loans to someone else. If yours does, they’ll have to tell you here. Frankly, it doesn’t make a lot of difference because even when loans get shuffled around a lot the terms have to remain the same. Sign here so everybody knows you saw this form and got a copy. Depending on who you’re borrowing what from, the Truth in Lending disclosure may save you a lot of money, pain and emotional suffering. Really. With the old forms, many people claimed, rightly or not, that they had no idea their rates were adjustable or that they’d have to bring so much to closing, leaving their Realtors gasping for breath and a lot of chaos at closing. To battle that, we’ve got these new forms, and they’re pretty awesome. Along with being great tools to ensure you’re ready to buy at all, you can also collect several of these and use them to compare the different loan products you’re considering. That’s a nice feature if you’ve got options, though not everyone does. This way, you can be sure you’re willing to pay what it’ll cost to get an FHA or a VA over a Conventional before you sign on the dotted line. That’s pretty cool stuff, even if you’re not a real estate nerd.